We welcome you to the Abbey Guest House, privately run bed and breakfast guest accommodation in the heart of the historic city of York. 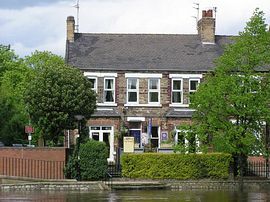 Ideally situated on the banks of the River Ouse, only a few minutes walk from the city centre of York and close to all tourist attractions, entertainment facilities, restaurants, bars and shops the Abbey Guest House can be your base for whatever type of visit you make to the city. We have a lovely garden with a flower-filled terrace, the ideal place for a pre dinner glass of wine overlooking the riverside walk into the city centre. The Abbey Guest House has only five guest bedrooms, ensuring a personal service for all our guests and a more intimate atmosphere than many hotels. All of our rooms have en-suite shower, toilet and wash hand basin facilities. Our rooms are decorated in a contemporary style with neutral colour schemes and comfortable duvets and pillows. We have two river view rooms, one twin room and a further two double rooms, one of which is a Superior Double with a TV seating area for relaxing, this is most suitable for those on longer stays with lots of luggage! Car Parking - The Abbey Guest House has its own private car park directly adjacent to the house. Parking is free for our guests. Laundry. For those travellers away for a longer holidays we are able to provide a laundry service at additional cost. Recommendations - We are happy to sit down with you and provide help and suggestions of what to see and do during your stay, and also with places to eat and drink in the city. Lovely riverside location close to the city centre. Private car park adjacent to the house. We are able to cater for vegetarian breakfasts and other special diets with advance notice. Take the A19 turning into the city centre; the junction is at the Rawcliffe Bar Park & Ride site, and you will see a Leapfrog Nursery on the roundabout. Follow the road into the city for approx 2 miles going straight through the traffic lights at Clifton Green. Once you have passed the Churchill Hotel on the left and the York Registry Office on the right look out for the road Marygate to the right - the end of the road is marked with a tower which once formed part of St Mary's Abbey. Turn down Marygate and follow the road to the end where it bears to the right - ahead of you will be the Marygate Car Park. Turn left and then immediately right which will take you down behind the row of houses which is Earlsborough Terrace. The private car park for the Abbey Guest House is at the end of this small road - please be careful when you get almost into the car park as you have to cross a foot and cycle path before parking up. Please park in any available space and come into the house via the side gate. Come out of the main entrance to York Railway Station and walk left towards the city centre. Cross Leeman Road and carry on walking past the bus stop and under the city wall. Bear left and walk across Lendal Bridge. Just as you get opposite Pizza Express there is a small set of stone steps which leads down to your left - walk down the steps. At the bottom of the steps walk straight ahead along the riverside on Dame Judi Dench walk, past the Museum Gardens on your right. Continue on to the end of the row of houses on the river side - Abbey Guest House is the last house in the row. If you go under the railway bridge then you have gone too far. Our rates start from £85 per room, per night, including breakfast & car parking. Single occupancy is available in some rooms from £70 per room, per night.